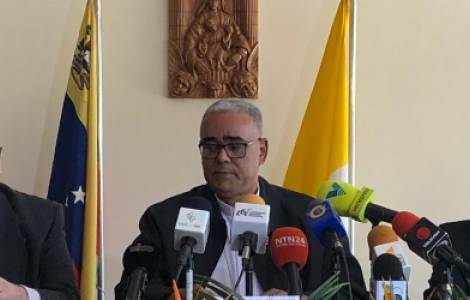 AMERICA/VENEZUELA - The Bishops: "A political leadership is needed to put the people at the center of their reflections and actions"
Caracas (Agenzia Fides) - "The Church, whose spiritual mission is clearly indicated by Christ in the Gospel, does not intend to replace in its role and in its vocation those who know and manage Politics. It does not aspire to dominate the social landscape, nor to become a factor of government or opposition. However, it encourages the laity, duly educated and aware of the rights and duties of their citizens, to make their voices heard and to intervene actively in the political arena, so that even the high principles and values that the Christian faith transmits to us may be lived in the public sphere and translate into works of common interest". This is what the episcopate of Venezuela writes in the exhortation entitled "Do not be afraid, I am with you" (Isaiah 41: 10), published at the end of the General Assembly of the Episcopal Conference, celebrated from 7 to 11 July, in which the Bishops analyzed the main pastoral issues, turning their gaze also on the country and on "its particular situation, which without fear of error we describe as a 'great tribulation' (Rev 12, 7-12), which affects the life of Venezuelans and seriously compromises their future". Focusing on the political situation, the message, sent to Agenzia Fides, states: "The main responsible for the crisis we are going through is the national government, to put its political project before any other consideration, including the humanitarian one; for its wrong financial policies, for its disdain for productive activity and for private property, for its constant aptitude to put obstacles in the way of those who are willing to solve some aspects of the current problem. The government appears before the country victim of external and internal maneuvers. This is nothing but the confession of one's own incapacity to run the country". As already highlighted in their Declaration of 23 April, the situation is increasingly serious in all areas of social life, for this reason the Bishops write: "It is necessary to give precedence in the action of the government and public and private institutions, to citizens, to Venezuelas, to men and women who suffer. To ignore people, to speak unduly in their name, to reduce this concept to a political or ideological prejudice, are the temptations of totalitarian regimes, which always end up by despising the dignity of the human being". The electoral consultation at the end of May, despite the many voices - including that of the Bishops - which warned of its illegitimacy, "served only to extend the mandate of the current sovereign. The high abstention, unprecedented in a presidential electoral process, is a silent message of rejection, aimed at those who try to impose a totalitarian ideology, against the opinion of the majority of the population". The exhortation demands respect for the fundamental freedom of Venezuelans to elect their rulers in a transparent electoral competition, without manipulation or favoritism, and condemns "attitudes of arrogance, authoritarianism and abuse of power, such as the constant violation of human rights", warning that "the Church does not encourage the desire for revenge or retaliation, but neither does it promote impunity for crimes that threaten life, human dignity and fundamental rights". Therefore the Bishops underline: "Venezuela needs a political leadership that puts Venezuelan people at the center of its reflections and actions, aware that beyond the control of power, politics is the work of those who, driven by nobility and ethical principles, know how to put themselves at the service of citizens and not petty interests. Opposition leaders must offer people alternative to change and work harder for their well-being".